Quick reminder: FREE and discounted books! Just a quick reminder to you all that my first novel, The Ritual, is currently available for FREE (Kindle only), while my second novel is half price. Both special offers will last until Sunday. Links are in the top right hand corner of this page. This entry was posted in News & Random Stuff and tagged Free Kindle promo, Kindle Countdown deal, Kindle free, The Conspiracy, The Ritual on April 28, 2015 by Erica Dakin. This entry was posted in Bible Project and tagged Bible, Hizkia, Isaiah, Jeremiah on April 27, 2015 by Erica Dakin. Unusually, compared to recently, this week’s reading only covered two bible books. I finished off the tail end of the Song of Songs (which was much shorter than I thought it was) and made good headway into the revelations-like book of Isaiah. This entry was posted in Bible Project and tagged Bible, Isaiah, Messiah, Song of Songs, Stephenie Meyer, Twilight on April 20, 2015 by Erica Dakin. 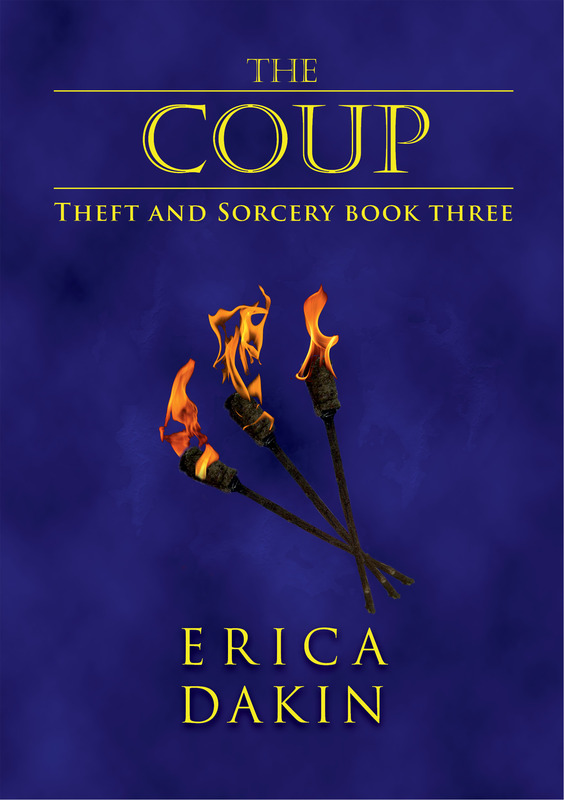 I am extremely pleased to announce that the final book in my Theft and Sorcery trilogy, The Coup, is now available for pre-order. The official publication date is the 1st of May, but you can order it now and it will be automatically delivered to your Kindle on the publication date. In addition to this, to celebrate the release of this final part of the trilogy, the first book (The Ritual) will be available for FREE from 28 April to 2 May, and the second book (The Conspiracy) will be discounted during the same period. Links to both books can be found in the top right hand corner of this site. Thank you for your attention/help/custom. If you go on to read my book, I sincerely hope you will enjoy it. This entry was posted in News & Random Stuff and tagged The Conspiracy, The Coup, The Ritual, Theft and Sorcery on April 16, 2015 by Erica Dakin. I’m still in the poetry section of the Bible (ish), and most of what I’ve read this week has been fairly disappointing. I was hoping for profound Solomonic wisdom from Proverbs, and maybe a few more gems in the last Psalms, but alas, it was not to be. This entry was posted in Bible Project and tagged Bible, Bible Project, David, Ecclesiastes, Proverbs, Psalms, Solomon, Song of Songs on April 13, 2015 by Erica Dakin. I am finally getting to a point where I feel the release date of my book is only a matter of weeks away. I have done my own full read-through and am in the middle of doing the edits for the eighty or so comments I noted down in the course of that. Two of my three beta-readers have finished reading, and much to my surprise they have both said it’s my best book so far. This pleases me, mostly because this has been the most difficult one for me to write. I was originally going to have a grey cover, but then figured that’d be too drab, especially for a romance novel. These covers may be too simplistic for a romance anyway, but I like them. An earlier incarnation also had three wooden juggling balls rather than torches, but unfortunately they just looked like three wooden balls, with no context to show that they were juggling balls, so I chose juggling torches instead. So there it is – I have a tentative publication date in mind, but I am still waiting on my third beta reader, so I’m not going to commit to it just yet. This entry was posted in News & Random Stuff and tagged Cover, Cover reveal, The Coup on April 7, 2015 by Erica Dakin. I think this week will be short, because I’ve read nothing but Psalms, and there really isn’t much to say about them. There’s 150 of the bastards, and if the week had been five days I might have got through the whole lot of them, but it wasn’t to be. It’s all Jesus’ fault for dying on a Friday. This entry was posted in Bible Project and tagged Bible, King David, Leviathan, Psalms on April 6, 2015 by Erica Dakin.